If you’re anything like me, sometimes 5 o’clock rolls around and you still don’t know what you’re going to cook for dinner. You might not have a ton of fresh veggies on hand, but you still want to whip up a meal for your family that’s nutritious, easy to make, and tastes great. And with little ones that have tendencies to be kind picky with what they eat, this just complicates things even more. One of my tricks for combatting the dinner time stress of not having the right ingredients or knowing what to make is keeping a well-stocked “cantry”. This helps to save time and allows me to provide my family with a healthy, flavorful and home-cooked meal on the table, more often. It’s homemade made easy. One of our favorite meals that we always have ingredients on hand for is my husband’s Texas Chili. It’s hearty, flavorful, and something the entire family enjoys. While we enjoy seasoning our bowls with spicier peppers from our garden like ghost peppers or habaneros, this can just as easily be made with less heat by swapping out the peppers for milder varieties. Or you can remove them completely like we do for our girls. This flavorful one dish meal requires no draining and can be ready to eat in as few as 35 minutes total time! Brown ground beef over medium heat until cooked halfway. Add onion to meat and continue cooking until meat is browned and onions are translucent. Add all other ingredients to pot and cook for 10-15 minutes. Reduce heat to low and simmer until desired consistency. What’s your favorite recipe that uses canned goods? This sounds delicious. I haven’t had chili in ages, so I must try this! oooooh this is perfect for this season! Love chili and fact that this is easy and simple makes it a keeper. 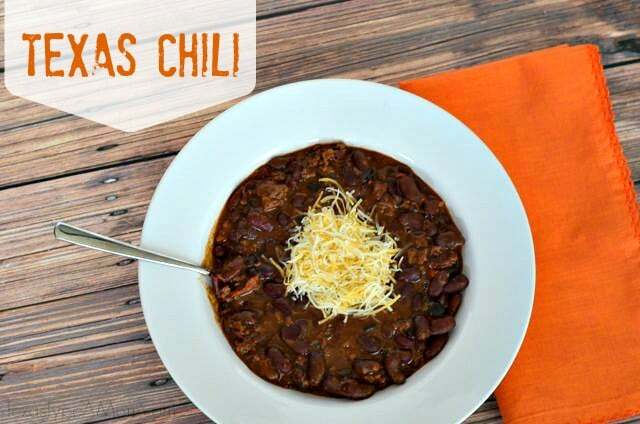 My husband asks for chili every now and then – I’ll bookmark this for the next time! I love quick and easy recipes like this one! Your chili looks delicious. The simplicity of the recipe also makes me like it even more. This is the perfect season for chili. I am adding this one to my list. THANKS! This looks super easy on a busy week night! That’s one good looking chili recipe! We are huge fans here and will need to try this one. I’ve been looking for a great chilli recipe, thanks! This sounds delicious – perfect for a cold rainy day like the one I am looking at through my window right now. 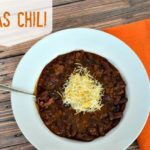 I love chili – and I am one who prefers it to be heavier on beans than meat, so this works great for me. we always have to have beans in our chili, I don’t understand chilit without beans. I have a good forty cans of stuff in my pantry, each one will get used for something sometime and I love having a good stock of canned foods so that I generally have a variety of things on hand if I need them. Sometimes it’s so wonderful to just open and pour a few cans! Cheers for chili lovers!! I make my chili similarly. I love it! You can combine left over chili with a few other cans (Rotel, canned corn, canned mixed vegetables, diced tomatoes with peppers and onions, and more kidney beans) to make a great soup. Your Texas chili looks awesome! It’s such a great comfort food in the winter. Your chili is so simple! I’m making chili tomorrow, it is chili season, yay!! We eat chili almost once a week when it is cold. It is a family favorite for sure. And this looks good. Ok, I’m from NC and I’ve had “debates” with my husband’s family who is from Texas. They believe no beans go in chili and I’m all for them. I always thought it was a Texas thing but I guess they are just plain old wrong! Ha! This looks great btw! Chili sounds good right now!